With classically fragrant natural oil of bergamot. Naturally caffeine free. Great taste 2018. 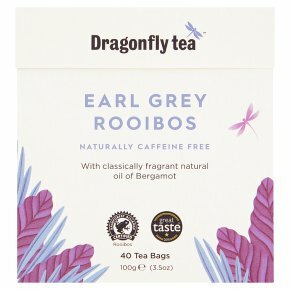 We only use the finest oil of Bergamot to give our Dragonfly Earl Grey Rooibos the authentic Earl Grey taste. Uplifting, aromatic and naturally caffeine free. Rooibos (or Redbush) is a full-flavoured, naturally caffeine free tea that grows only in South Africa's remote Cedarberg mountains. Gently hydrating and low in tannin, it has long been valued for its natural goodness. We only use the finest natural ingredients. We never use artificial additives, preservatives, colourants or GM crops. Brewing Instructions Infuse in freshly boiled water for 3-4 minutes. Delicious with or without milk.